Everyone is susceptible to diabetes, but the elderly are at a higher risk due to a number of factors. Age, diet, genetic and environmental influences are only some causes of diabetes in seniors, so it’s important to monitor your elderly loved one closely for signs of diabetic disorders. The experienced senior care professionals with Rhode Island Home Care Assistance are here to explain what symptoms to watch for. Diabetes is diagnosed with blood tests. There are several tests that are commonly used in order to check for blood sugar problems. Hemoglobin A1C Test – This blood test measures the average blood sugar of your loved one over the past two to three months. It can give doctors an idea of how long your family member has had blood sugar problems and how serious it is. Fasting Glucose Test – This procedure is performed after your loved one hasn’t eaten for eight hours and can test for both diabetes and pre-diabetes. Random Glucose Test – This test is taken randomly, without regard to how long it’s been since your loved one last ate or drank. It can give doctors a good idea of how your loved one’s body is using the food that is eaten. Oral Glucose Test – During this test, your loved one will go eight hours without eating and then will drink a sweet beverage. Two hours after consuming the drink, your loved one’s blood will be tested to see how his or her body used the sugar that was consumed. A well-balanced diet and exercise plan is necessary for both type 1 and type 2 diabetes. Carefully balancing carbohydrates with fiber, protein and fat will help keep blood sugar levels stable. Additionally, your loved one may need to take insulin if his or her body isn’t producing enough. Medications may also be prescribed to keep blood sugar levels in check. 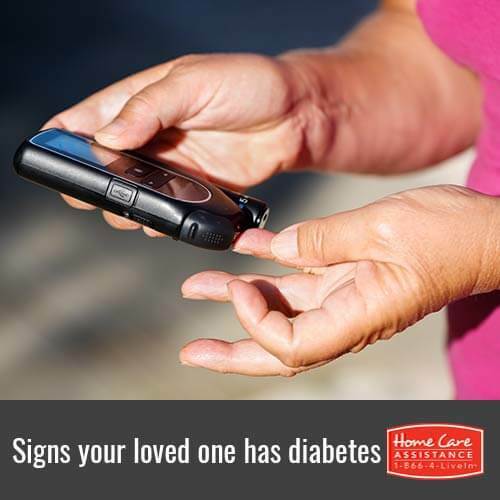 Diabetes is a serious illness that should be monitored and treated carefully, and if you feel your loved one requires additional help managing diabetes, turn to Home Care Assistance. We offer both Rhode Island live-in home care as well as flexible hourly care for seniors, and our trained caregivers can help with diet, exercise, transportation, and medication reminders. For more information, contact us today at 401.284.0979 and request a free consultation.